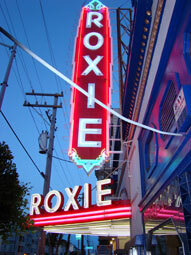 Although she died in 1963, Edith Piaf worked her magic in song again last weekend at San Francisco’s Roxie Theater. Guests stepped in under the venerable marquee in the city’s gritty Mission District to be wrapped in a kind of Piaf-like embrace. Piaf’s people were all assembled. Then she appeared in the person of Raquel Bitton, star of the documentary, “Piaf, Her Story, Her Songs,” in which Bitton pays homage to the great chanteuse and soul of Paris in song, and by interviews with those who had known and worked with her. Afterwards, the personable and witty Bitton answered questions. No, she was not one of the singers who tried to become Piaf, she merely wanted to pay tribute to her. As for secrets of how to get people to pour out their hearts in an interview, she had one sure tip: cases of good wine. In fact, if she were to actually meet the legendary “Little Sparrow,” what would she do? Invite her to a café for wine, of course, and pizza. Soon, too soon, it was time to leave the black of the theater to head back into the black of night. On the streets of the Mission, where dealers of all sorts, street artists and Mexican restaurants festive with Christmas lights all cohabit cheerfully with prostitutes, cops and visitors who come and go on the BART train, a Piaf refrain kept playing through my head. This was not her famous “vie en rose,” but rather the world depicted in the song “Milord” where a girl of the shadow world of the port addresses an elegant gentleman in company with a beautiful woman: “Mais vous pleurez, milord/Ça je ne l’aurais jamais cru.” But you’re crying milord; I never would have believed it. Piaf played here. It was as black as her dress, illuminated by neons and flashing lights. Her kind of people. Her part of town. Sounds so much fun. I don’t know much of Edith Piaf, but I’ve seen the movie adaptation of her life and was first introduced to her music via the movie Sabrina in which Audrey Hepburn who plays the main character sings La Vie En Rose. That song in particular always seems to put me in a comforting mood no matter what type of day I’ve encounter. Thanks for sharing your thoughts on this event. Thanks for getting back to me and I’m glad you enjoyed hearing about Piaf. She was extraordinaire–in all her incarnations.